It has been officially over one month of consistently waking up at 5 am, followed by a morning protocol that sets me up for success. If you're wondering why I'm doing this, I've written a blog post on my 3 Biggest Reasons to Wake up at 5am which I invite you to read. Here is a picture I took on my sunrise walk with my husband. I send it to you, since you're starting this life changing journey of waking up at 5am. You get to see things like this! 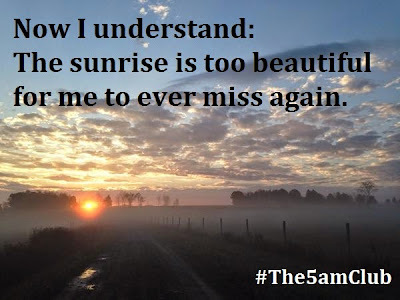 Don't miss the sunrise. Let me briefly share my morning ritual, which is based off the teaching of Robin Sharma, author of The Leader Who Had No Title and The Monk Who Sold His Ferrari and then explain how it's been changing my life. In this post I share with you my best tips that I've learned from the month or so doing this, which should help propel you even more. By no means has my system been perfected, but this post is to help me celebrate and track my progress, and serve you at the same time. 5:20-5:40 Review the day ahead and goals- using my planner and notes, what do I need to accomplish, what challenges face me? Write down some things I'm thankful for in my journal. 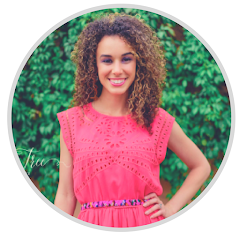 I have a few tips and tricks that I've gathered in my first month that should help set first-timers up for success! REALIZE THAT GETTING OUT OF BED IS THE HARDEST PART. All you really need to do is put your feet on the ground, stand up, and walk away from your bed. Everything after this comes easier. 1) Get your loved one to do it with you - or make an online accountability buddy. This is so powerful- if you're living with your husband or wife, or have a child, make this a team effort. On the days you feel weak, the other may feel strong and coax you out of bed. My husband has been awesome about this. After being convinced that we couldn't have the life we want unless we develop habits of the truly productive and successful, he has become determined to maintain the 5am club. 2) Don't be sleep deprived- adjust your sleep schedule too! The 5am club isn't a sleep deprivation exercise! You'll notice a lot of little things you're going to have to change to support your new operation. You'll feel tired sooner. So, don't sabotage your next morning by staying up too late. Get your full 7 hours and you'll be more energized to wake up at 5am. 3) Have an iron-clad reason. Why are you doing this? So that you can be rich one day? No - that isn't a good enough reason. Your reason needs to be totally intrinsic. 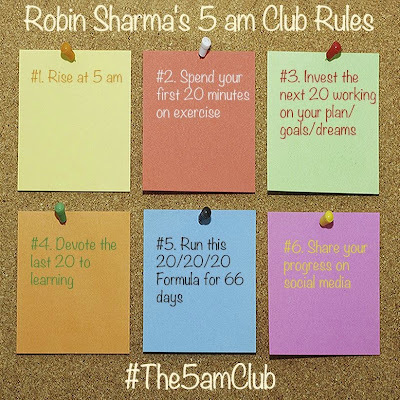 I tried and failed to do the 5AM club last year because my reason wasn't good enough. At that time when I failed, my reason was "I want to be healthier". Can you see why that didn't work? It didn't work because, most of the time I feel like I'm healthy enough. It's a weak reason. It's easy to wriggle my way out of it- "sleep is healthy too"..."A little more sleep, and I'll feel better than if I had taken a walk this morning" - Do you see why this was a road to failure? Do you see how easy it is to fail without a good enough reason? There are no such thing as "morning people" and "night people" - that's just a myth. One thing I've learned from Tony Robbins and other great personal development coaches is that your IDENTITY is what matters. If you consciously identify yourself as "not a morning person" you have done yourself a huge disservice and totally blocked your growth in this area. So change your story. Change how you view yourself in your mind. If you can't get over the negative self talk, you will not have progress! Here's what DID work. I totally changed my identity. I told myself, "I know there's no way that I could ever be the person I want to be, accomplish all I want to accomplish, and feel as good as I want to feel unless I get up at 5AM every day. I am the kind of person that gets up early. So getting up at 5AM is just me being more like myself. When I don't do this, I'm not myself. I need to get up at 5AM to get what I need to do done." 4) Set up things to look forward to: A healthy reward system. Consider the rewards of getting up early. You will see the sunrise. You will finally get to read the article you printed out for yourself yesterday to read. You will get to try a new recipe in your crock pot. You will get to review your goals. Basically- you need to have a plan for that time between 5am forward and a fully assimilated understanding that will be greatly beneficial to you. It must seem so beneficial that missing it would come at a huge loss. Just getting up at 5am isn't good enough- you need to have a plan for your time and establish in your mind the rewards it brings. 5) Set up an accountability exercise. A Facebook group (or any sea of strangers) is NOT an accountability group. 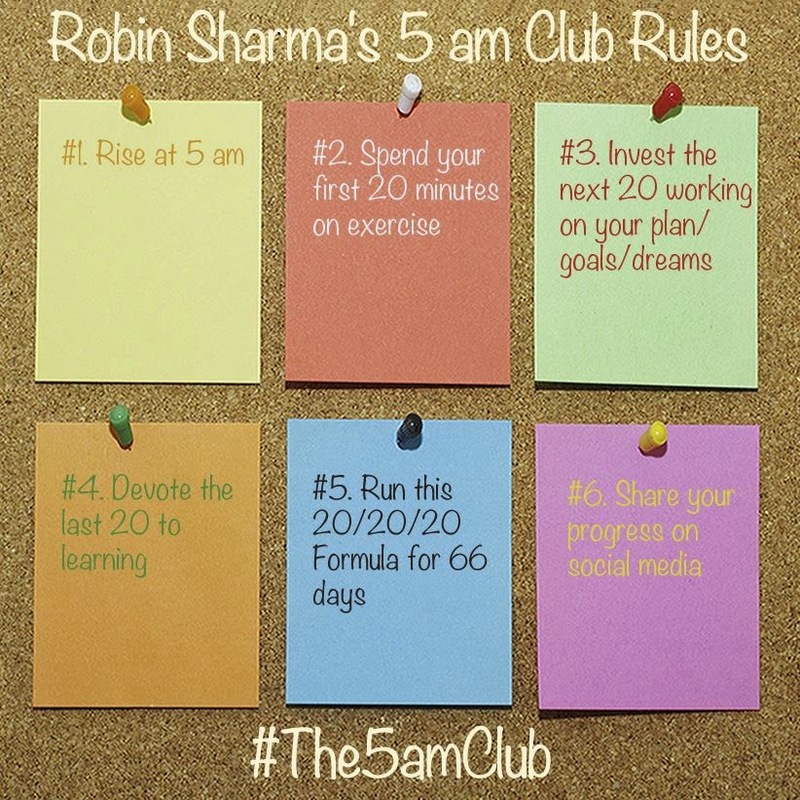 Tweeting the #The5AMClub hashtag isn't good enough either! Every morning, on my morning walk I take a picture during this peaceful time at send it to my mother (it's about 7:30am at this time). That is a real, live person, who is now used to receiving these messages and would be sad if I missed one. She is part of the reason I never miss a walk, even on top of the beautiful time it is with my husband. The image that I send to my mother has become a lovely accountability exercise that makes her feel loved and remembered, too. There are even more tips that I will send you in the coming weeks. I hope to see you again. If you have any feedback or suggestions, or tips of your own, please add them in the comments on this blog. PS: If you're really planning on perfecting your morning ritual, I recommend this book called "The Miracle Morning" by Hal Elrod. Hal even has a Facebook group dedicated to early risers, where I hope you'll join me!